John Rocque (c. 1709�1762) was a surveyor, cartographer, engraver, map-seller and the son of Huguenot �migr�s. Roque is now mainly remembered for his maps of London. 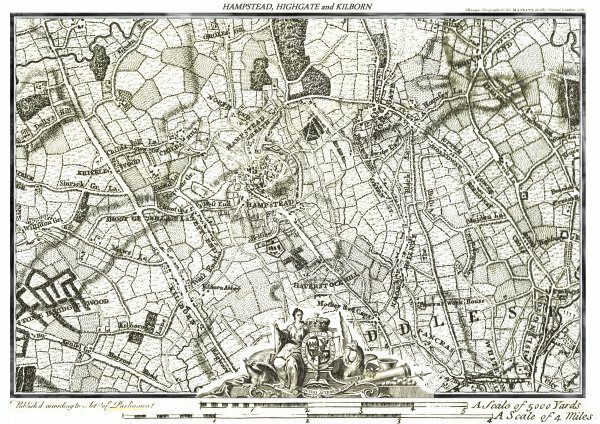 This map dates from the second edition produced in 1762. London and his other maps brought him an appointment as cartographer to the Prince of Wales in 1751. His widow continued the business after his death. 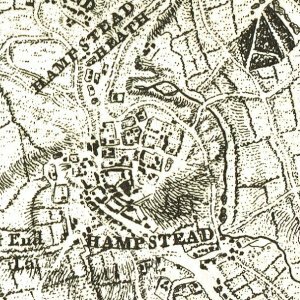 The map of Hampstead covers an area stretching from the edge in the northwest of present-day Dollis Hill to Islington in the southeast. Clicking Buy Now below will take you to a secure PayPal session. Please note that transactions will be managed on behalf of GlobalGuide.